MacOS High Sierra includes the all new APFS file system, which is arguably one of the most significant new features introduced in the new Mac operating system update. Nonetheless it’s possible that some Mac owners with SSD volumes will want to not convert the existing HFS+ file system to APFS file system when installing macOS High Sierra. With a little command line magic, you can skip converting to APFS during the macOS High Sierra installation process if desired. This is not recommended and should only be applicable to advanced users who have specific reasons to not want to convert a Mac to APFS. APFS is faster and offers better encryption, amongst other benefits, so it’s generally recommended to use APFS if the Mac supports it. APFS is currently only supported on SSD drives, with Fusion drives support for APFS soon to arrive in a future Mac software update. By skipping APFS conversion of file system, macOS High Sierra will install with the longstanding HFS+ file system instead. * You will need the full installer to have the Contents/Resources/ options available to you. You can download the full macOS High Sierra installer with these instructions if you’re getting the little mini-installer without /Content/Resorouces/ folder. In case you were wondering, skipping APFS can be achieved when running the High Sierra installer directly from Mac OS or when using a macOS High Sierra boot installer drive. Mac users who ran the beta of macOS High Sierra may remember earlier versions of the beta builds had a toggle setting during installation to skip APFS conversion, but that option toggle is no longer available in the installer. Despite the Apple support article saying that you can’t opt out of the transition to APFS, it turns out that you can skip APFS if you choose to start the installer from the command line of Mac OS and give a directive to skip file system conversion. Outside of using the Terminal approach outlined above, or installing on an HDD or Fusion drive, there is no known other method to skip APFS. Again, there is no benefit or particular reason for most users to skip APFS conversion. 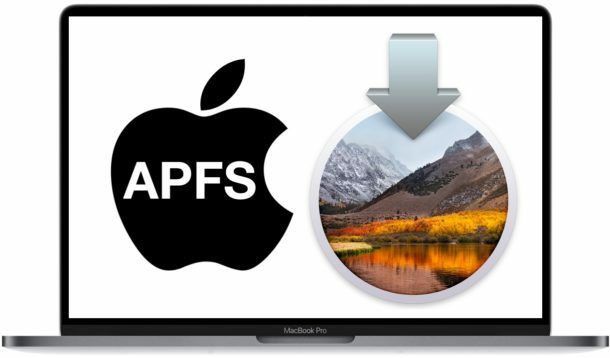 Skipping APFS file system on a Mac with a flash drive means the computer won’t see the potential performance boost offered by APFS with High Sierra. This is really only for advanced users who need to skip APFS for a specific reason, usually for networking or drive sharing compatibility purposes. The reason might also be that the apsf cannot be installed on a raid0 volume. What happens if you have your disk partitioned so you can dual boot two different version of your operating system, eg, Yosemite and High Sierra? Does the Yosemite partition remain HFS? Yeah, just like you can have a HFS+ and FAT32 or NTFS or whatever on the same drive, you can have an HFS+ and APFS partition as far as I know. I am not a “nerd” and I do not understand what will happen to my backups online or on hard drives (not SSD) if I install High Sierra. Will those drives be readable and writable? or not? and if not, what do we do? I’d like to see an article that is easy to understand for all of us non-techie types. Thank you. Other reasons include all users of Adobe Illustrator which goes fubar on APFS. There is likely more essential software which is prohibitively incompatible. Why is any performance boost with APFS “potential” at this point? What factors determine performance improvements or degradation by converting to APFS? Also some folks have disk utilities that do not work with APFS (due to lack of detailed documentation on it from Apple), that’s a good reason to skip it for now. My Mac volume is a conventional HDD, so obviously APFS won’t install there. However, I have a couple of external SSDs which I connect to the Mac from time to time. When (and if…) I get round to installing High Sierra, will these drives be forced to change to APFS format ? Presumably that would render them unreadable by a non-High Sierra machine ? “usually for networking or drive sharing compatibility purposes” …this is likely many Apple users! Why would anyone want to make their network of Apple devices ( of various vintage ) plus all of their external drives etc. suddenly STOP working together? I’m staying with Sierra for the foreseeable future on my MBP TB, though I have installed High Sierra onto a 2008 Mac Pro with great success using the macOS High Sierra Patcher Tool . You also might want to search around and make sure people have reported good experiences with RAID setups and APFS and High Sierra with similar configurations. Backup first! it even mentions it earlier but wont proceed past this arguments thing. Thanks Paul, will give that a shot. The entire reason I’m going this path is that I know APFS was disabled for RAID0 setups on SSD. I assume that HFS+ still works the same, and has been working well on Sierra (and previous incarnations) for a long time. I renamed my boot volume to “SSD”, so guessing it would be “–volume /SSD” for the install? Yeah, I am getting the same issues as bogchop. I also noticed that the MacPro (5,1) needs a firmware update. Question ? – Before installing 10.13, should one first update the firmware (via a separate drive) and then attempt the RAID 0 installation? Switching to HFS+ for now. We are trying to mass image with High Sierra and we want to add the “Don’t convert” flag to the automated installation. How do I go about doing this? That’s odd. Were you using Migration Assistant, or just dragging the library? Pitty, but –volume option is not available anymore thus I can not install on my 3rd party raid…. I have been looking for 3 days for the answer to the upgrade issues with HS. This is a great article and the solution works like a charm. Additionally I called Apple and they have no idea of this problem, HA! The people answering those calls are not IT engineers, so you need to escalate this, or easier find the answers online. Avoid Case-Sensitive formats if you can. See the person a couple spots above. Apple Extended (Journaled) please. The only way to un-APFS is to connect it to another machine and totally wipe it. It takes time, effort, and patience. It’s a total PITA, but it can be done. Lot’s of monkey business. Another thing I found out the hard way is that if you accidentally clear your partition table on APFS, there is virtually no way to recover it that I could find. Better have good backups. Did this while installing a linux os on external HD and mistakenly selected the wrong disk. Wait, wha?! Every benchmark I’ve seen shows it slower than HFS+, sometimes by a wide margin. Can anyone tell me whether the 10.13.4 combo update will convert my SSD to APFS? I’m running a triple-booting MBPro and APFS just confounds my OCD nature when it comes to my GPT. If TheNameOfYourVolume isn’t already APFS, then you should be fine. Everything seems to work better when upgrading from Sierra with HS in the Apps folder from the App Store, not through the Software Update command. So that it can live, here’ the Sierra to HS upgrade command sans APFS. Just had a client with a formatted APFS drive that doodoo’d itself after power outage, without tools like Diskwarrior you don’t have a hope in heck of not spending a whole day sorting out this Bleeding Edge Technology. – At reboot press and hold alt/option key and choose usb NOT the MacOS install..volume! Your goal is to change the true to false!!! No other changes should be made. That’s it! Now you’re ready to quit Terminal, reboot, and continue the installation process by booting the “Boot macOS Install from …” partition. When you’re done, you’ll have a fresh install on HFS+J instead of APFS!!! Success! Thank you, Brax84. I am now running High Sierra on an SSD formatted as HFS+. Does anybody knows if this tip applies to the Mojave installer? – I guess the answer is affirmative, but not sure at all. I tried Brax84’s method for installing High Sierra (see above) with the Mojave installer but it did not work (the volume was converted to APFS). Although the minstallconfig.xml file is basically the same, my guess is that Apple no longer uses the ConvertToAPFS parameter and merely left it in for compatibility. Error: You may not install to this volume because it is part of a AppleRAID. Error – could not find OSINstallersetup.framework…. The framework folder is in the content folder. Help!